Our congratulations to India and Ruby in Year 7. 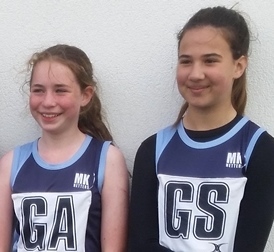 Following open trials held earlier this year, in June, both girls have been selected to form part of the MK Netters U13 Excel Regional Squad. The Excel programme at MK Netters has been developed to ensure that the game is both player centred and in line with long-term athlete development. The Excel programme is part of the England Netball process for developing athletes with the attributes to attain excellence. Admission to the Excel programme is by assessment and screening and is open to all players in the region, regardless of club or school. Successful applicants become part of the Excel regional programme in which squads will be chosen to compete, to be part of the southern regional league; qualifying for the national club’s competition being the ultimate goal. MK Netters have a good record of getting regional teams to qualify for national finals. A huge achievement for India and Ruby considering they were up against girls a year older each competing for one of only 15 spaces on the U13 squad.